This month, a slew of art-centric events will be held in Singapore, from contemporary art shows like Art Stage Singapore to more intimate gallery openings at Gillman Barrack’s Art After Dark. 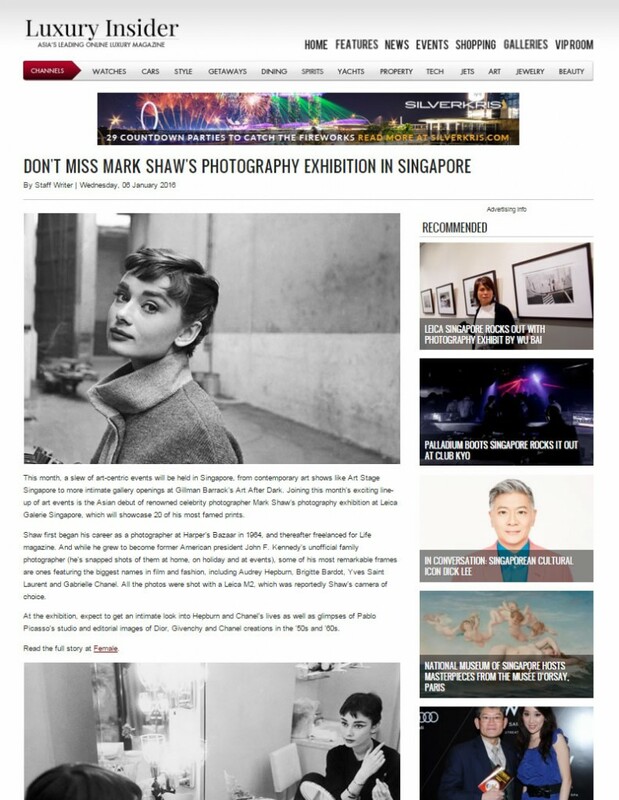 Joining this month’s exciting line-up of art events is the Asian debut of renowned celebrity photographer Mark Shaw‘s photography exhibition at Leica Galerie Singapore, which will showcase 20 of his most famed prints. Shaw first began his career as a photographer at Harper’s Bazaar in 1964, and thereafter freelanced for Life magazine. And while he grew to become former American president John F. Kennedy’s unofficial family photographer (he’s snapped shots of them at home, on holiday and at events), some of his most remarkable frames are ones featuring the biggest names in film and fashion, including Audrey Hepburn, Brigitte Bardot, Yves Saint Laurent and Gabrielle Chanel. All the photos were shot with a Leica M2, which was reportedly Shaw’s camera of choice. At the exhibition, expect to get an intimate look into Hepburn and Chanel’s lives as well as glimpses of Pablo Picasso’s studio and editorial images of Dior, Givenchy and Chanel creations in the ’50s and ’60s. Read the full story at LuxuryInsider.com.